Ted Cruz crisscrossed New Hampshire Thursday, the stump speech throughout the day pretty familiar, hitting on core issues as he tries to rise up in the polls before the primary. At his fourth campaign stop of the day, Cruz met with voters in Laconia Thursday night, still riding high from Iowa. "We saw that old Reagan coalition coming together," he said. "We saw conservatives, and evangelicals, and libertarians, and Reagan Democrats, all coming and standing together." 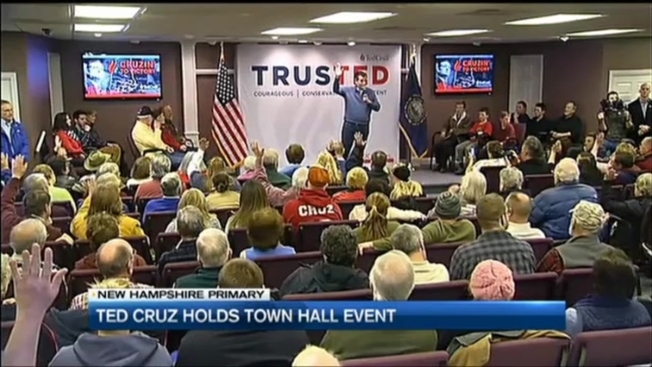 Cruz hit on hot-button issues, telling the crowd that as president, he'd abolish Obamacare. He said he'd push for a simple flat tax and abolish the IRS. He also took a swipe at his Democratic rivals. "What are Bernie Sanders and Hillary Clinton proposing? Yet more of the same, more regulations, more taxes, more debt," he said. Earlier in the day, at a town hall in Portsmouth, the Texas senator said he'd protect gun rights. "I got to say on this point, New Hampshire and Texas, we see eye to eye," Cruz said. "Both our states, we define gun control as hitting what you aim at." The candidate's campaign team says it's because he’s been staying late at these events to try to greet as many voters as possible.